End of 2016, I've been obsessing with sheet masks. I've tried pretty much a lot of brands (thanks, Watsons) already. Until I bumped into this uhmazing beauty online shop here in the Philippines, which is BeautyMNL. They've got a lot of authentic beauty products from Korea, Japan, and United States. And I couldn't be more overwhelmed. So I decided to buy some things and thought I could share a little haul and review of the products I bought. Before we jump into the main topic, I would like to make a shoutout to Beauty MNL for sending me these products for only 3 days. I was expecting it to arrive after a week or two. Surprisingly, my package arrived after 3 days when I purchase them. So that's a big thumbs up! I found out the brand Innisfree from a YouTuber I've been watching and she ultimately loves this brand. So why not try it. Of course, I love sheet masks, as you can see I bought from three different brands. This sheet mask was amazing, maybe you're thinking I'm not being honest and these words just came out from the mouth of a sheet masks addict. But believe me, I loved this sheet mask. It made my face soft and refreshed. I'm definitely trying out the other essences. I actually put this sheet mask on before I went to school. And it goes so well with my moisturizer and cream. My face ended up a little bit of baby face, which what everyone loves. I also love this sheet mask. I put this on at night and made my brother jump because he thought he saw a ghost. Sorry bro. What I love about this mask is, the essence dries quickly. I hate over-oily face because it doesn't suit me, it would probably suit me if I had a fair complexion. But I'm a morena striving to be mestiza. Let's be honest, either than that.. there's nothing really special about this sheet mask. Just a typical one. I still like it though. Watching KDrama means knowing about cushions. I don't wear makeup that much but I've always been curious about cushions. I don't know anything about this kind of products though but since I saw this kind of product in a lot of KDramas. Again, why not try it. Maybe I'm not used to wearing makeup yet so if I'm gonna be honest, I didn't like the quality of this product. It felt so cakey on my skin and it was definitely uncomfortable. But I at least like the coverage of it because it covers up pretty much all my blemishes. Still, I'm going to use this product every now and then. However, this will fit so well to those people who are used to wearing makeup. It's just unfortunate, I'm not yet used to wearing makeup so putting them on my face have always been uncomfortable. After all, I'm not going to stop exploring so why not leave some recommendations for beginners in the comment section below. If you have pretty skin and doesn't get pimples at all. I'm so jelly of you! I get pimples every now and then and it frustrates me a lot. I always end up begging them to leave me. This girl right here found a way to get rid of them by buying this precious product which actually works magically. After I put two-three patches, the pimple leaves me. If that doesn't convince you, I don't know what does. I'm looking forward for more purchases soon. Wow, you've reviewed a lot of sheet masks! I could definitely do with trying some of these out and giving my skin a boost! Yes, I did. Sure, you're skin needs a boost every now and then. I definitely need to try some sheet masks soon! I've never tried a sheet mask, but I'm definitely a lot more interested after reading this post. Especially since I suffer from acne in lots of areas on my face! It's always the best feeling when you first started using one. Go for rice sheet masks for acne scars, you go girl! It is amazing. Lol, everyone loves tea tree. Yes, COSRX is an amazing brand. Oooooh the tea tree oil mask is something I'd go for definitely. Thanks for sharing! Yes it definitely is! Sure, thanks for reading. Sounds cool, literally cool. Tea tree for the win! Yes, please. Go try them out! I just finished doing a haul from Beauty MNL just now. And mostly, they're for skin or hair care since I want to focus on that for now. Haha. Ordered a set of those COSRX's Acne Prone Patches, too! I wish they're as effective as they say. They are effective as long as you're using them right! You won't regret it. I love sheet masks too, obviously lol. They are literally brilliant. Thank you. Go try the tea tree mask! Investing to skin care needs a lot of effort and money. However, it will be worth it. Thanks so much! Yes, tea tree mask made my face feel soft. Thanks, thanks. You're so lovely. You did a good job with this review! I am also thinking of buying some of the products you mentioned (specially the Innisfree tea tree mask, because who doesn't love innisfree?! ), and I’m definitely considering them on my next Beauty MNL transaction. 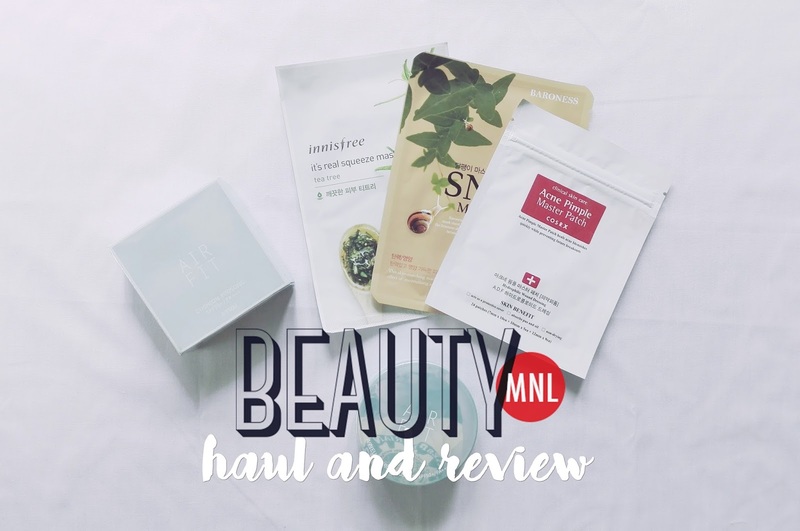 I also recently made a post on my blog about my first skincare haul on Beauty MNL, you might be interested in looking at it (http://www.janineladdaran.com/first-haul-beauty-mnl/). Purchasing in beauty MNL was really easy and hassle-free, I would definitely order more.